There are many stories that pop up about the beginnings of Limoncello and it's hard to authenticate fact from fiction. One story says that in the late 19th century, Vincenza Canale, and innkeeper on the Isle of Capri was serving her homemade lemon liqueur to guests as a "digestivo" - an after dinner digestive aid. Word spread, requests were made for bottles and the family began to bottle the "limoncello". Today the descendants of Signora Canale run one of the leading Limoncello companies, Limoncello di Capri. The second most prevalent story is centered around Maria Antonia Farace who made a sweet lemon extract from lemons in her garden. Extracts are alcohol based and supposedly her nephew took this one step further and introduced limoncello to the world shortly after the first World War. One fact stands out amongst all the speculation - Massimo Canale, grandson of Vencenza Canale - started producing LIMONCELLO at Limoncello di Capri and, officially in 1988, he patented his formula and trademarked the name. 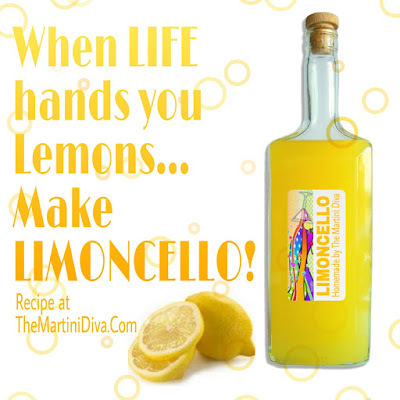 Please Note: The Traditional Lemoncello recipe does NOT call for vanilla! UNPROTECTED ZESTING LEADS TO HAPPY ACCIDENTS! Zest all your lemons with the microplane grater. DO NOT zest to the point of seeing the white rind! If you zest into the rind your Lemoncello will be bitter. Your lemons should still be a pale yellow after being zested. SWIMMIN' LEMONS - GO FOR THE PRIZE BOYS! Put all your lemon zest into a cheesecloth bag (you can make your own with a sheet of sterile cheesecloth and a sterile string). I find doing this saves me a lot of time in the filtering and straining process at the end of distillation. 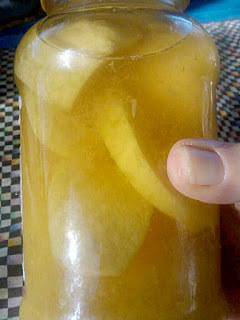 Drop the bag of lemon zest into your infusion jar and tighten the lid for a good seal. *If you opted for adding the vanilla - split open the beans, scrape out the seeds and add these to your lemon/vodka mix. Adding vanilla does not make a classic Lemoncello but it does lend a little extra sweetness and a kind of a mellowness. Store in a cool dark place for a minimum of ten days and up to a month and a half. Remember the longer the distillation the richer the lemon flavor. I always do the whole month and a half. If you choose, shake the bottle once a day - at least in the first ten days. While your Lemoncello is getting it's beauty rest you can take your original vodka bottle, soak it in water and remove the label and prepare a fun label to attach to the finished product. Feel free to use any of my blank recipe cards as your label - just print it on paper instead of card stock. After I attach my labels I usually put a nice wide piece of clear tape over it to keep it from getting wet and running. Since you have a month and a half to wait you could also. learn a little Italian, buy a nice vacation wardrobe and take an actual trip to Italy! Just because you're a parent to be doesn't mean you can't enjoy yourself before the baby comes! BE SWEET TO YOUR NEW BABY After the first distillation process (and after your lovely vacation), prepare a simple syrup by combining the sugar and the water, bringing it to a boil until the sugar has dissolved then remove from the heat and allow to cool. Add the cooled simple syrup to your lemon/vodka infusion, stir until completely mixed. Simple syrup is mother's milk for maturing Lemoncello. Replace your jar lid and send your baby Lemoncello back to it's dark corner to nap (distill) one more time - again for a minimum of ten days and up to another month and a half. The longer you allow for distillation the smoother your finished product will be! A happy Lemoncello is a rested Lemoncello. Now, comes time for dumping that little diaper of lemon zest in it's cheesecloth pamper and freshening up your matured Lemoncello for it's true purpose in life - to be enjoyed as an aperitif or in a cocktail. Just throw the whole bag out and set up for the straining process. Next set your metal strainer over another infusion jar and pour the lemoncello through it twice to catch any of the particles that escaped the cheesecloth bag. Rinse the strainer out. Now set the strainer back over the other infusion jar and set a fluted coffee filter in it then pour the Lemoncello through this. Do this at least twice - I do it five times. If you're using the permanent filter rinse it thoroughly between strainings. The liqueur will filter slowly, be patient. When the liquid stops flowing - even if you see some liquid in it - throw this out and start with a new or freshly cleaned filter. What is still residing in the filter is what you are trying to filter out. The more filtered your Lemoncello, the prettier the color, the purer the liqueur and the better it will taste. You are now ready to send your Lemoncello out into the world and into it's own residence - you're going to bottle your Lemoncello. Sterilize your serving bottles (you can do this several ways - you can bake the bottles in the oven at 350 degrees for an hour or you can boil them for ten minutes.) Allow them to cool/dry completely then pour your Lemoncello in using a funnel and add your label. OH, WAIT - IT'S THE BOOMERANG BOOZE! Yup, your baby is back but just for a week - maybe! If you allow your bottled Lemoncello to "rest" for a bit it will get even smoother. The longer the rest, the smoother it will get. Give it at least a week - then, if you can't stand it any longer, kick that baby back out into the world of Happy Hour. I like to keep my Lemoncello in the freezer because it's wonderful ice cold and in a nice shooter glass for a quick and easy aperitif or pick me up. It also makes a nice palate cleanser and, of course, I make a lot of fun and interesting martinis with it! I'm very proud of my Lemoncello and I encourage you to give birth to your own!